In its recent earnings and operations update, GMX Resources presented a detailed operational update (see entire presentation, slides 13-28). Much of the presentation, which is filled with lots of interesting geological data, has been posted on these pages before, but I did notice one interesting revelation. 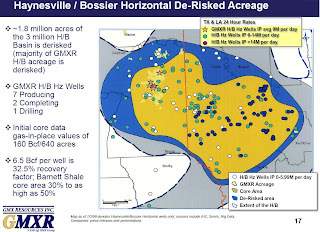 It appears that GMX is adjusting its well economics to use a higher production profile for its Haynesville Shale wells. As the two charts below illustrate, the newer profile is for a 6.5 EUR well versus the previous 5.4 EUR well. The company has found success with longer laterals with greater fracture stimulation events and is seeing higher initial production rates. 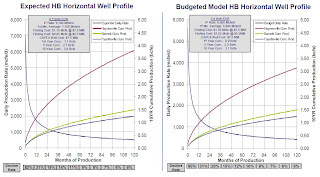 The purple line on the charts indicate the expected production over ten years from a Haynesville well, which is more than double those in the Fayetteville and Barnett shales. 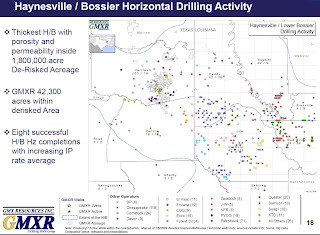 I tend to be a graphic person who sees more in an illustration than on a chart of numbers, so I found that the following three maps that the company provided did a great job of illustrating the progress of the Haynesville Shale to date. 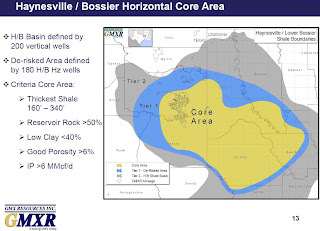 The first map shows GMX's interpretation of where the core area lies (and where the company has leases). The second map overlays color coded initial production rates, and the third generally shows where the producing companies are represented. It's interesting to watch the map fill out after only a year and a half of production. Within a few years, the dots on the map will be much smaller and really packed in there. Our baby is growing up.